Hole #3, par 4, 416 yards-The number one handicap hole of the course has a split fairway. It requires a layup shot of 250 yards. Too big of a drive will slope into the wash with no chance of recovery. Too short will leave one with a 200 yard carry to the heavily bunkered green. This hole requires a lot of thought, so play to your strengths. Hole #9, par 5, 509 yards-This is the best of the par 5’s for birdie consideration. A long drive will set up a chance to reach the large and receptive green in two. The fairway is framed by bunkers and prairie grass on the left side sloping slightly downhill to the waste area. The uphill green is guarded by front left and back right sand bunkers. Even a layup will produce an opportunity for a bird, making this an equalizing finishing hole for all players on the front nine. Hole #14, par 5, 564 yards-An uphill fairway drive with adequate bunkers left and right will test the risk of going for the green in two. A large sand bunker front left will save a short shot, but, anything long will be swimming in the small surrounding lake that is hidden from view on the right side by trees and mounding. Hole #18 par 5, 560 yards-This is one of the best finishing holes of any course in the valley. A prairie dune jutting on the left side challenges hitters to blast a big drive over to avoid the sloping of the fairway to the right. Too far right and you better have your canoe as the entire fairway is lined by a wide stream, although a bit of rough on the edge can save a slow roll from drinking deep. Surrounding water and sand make this a target green, entertaining the onlookers from the 19thhole patio of the Verde Grill. After the round, you will want to stop at said Verde Grill, with ample seating inside or out, to enjoy the great food and libations as well as the show of the next golfers on the green. Gary Panks’ brilliant design makes this course challenging but fun to play. 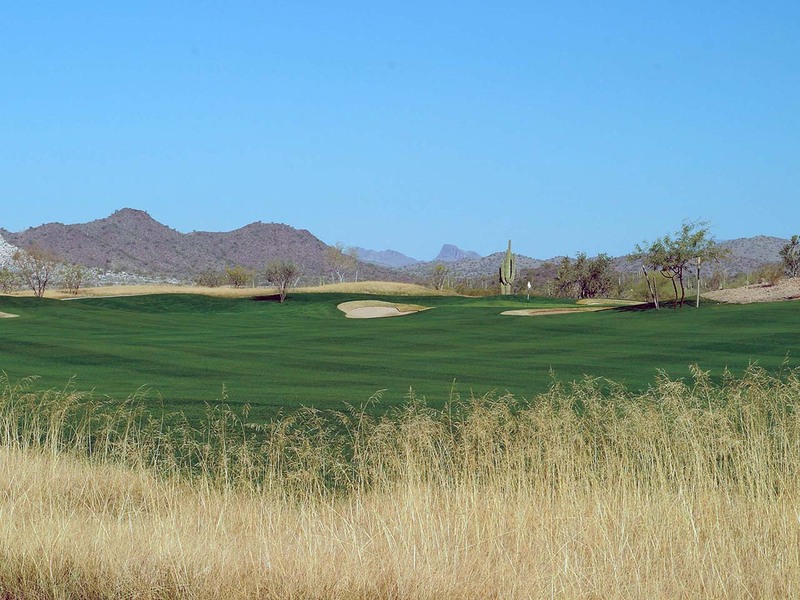 In fact, Vistancia is one of only 23 courses nationwide that received Golf Digest’s 5 star rating. That is reason enough to check it out. The price compared to the east side is another reason to play. In the few years of operation, the neighborhood has matured with housing, shopping and amenities. Many of the fairways on the course are now lined with homes, large and small, that are all impeccably maintained with beautiful landscaping and inviting patios. You get a warm sense of community. Once you try it, you may want to buy it. And if you do, now is the time.